I (Hugh) remember standing outside of a Church in 1988, not long after turning my life over to Jesus. I looked at the statue of Mary outside of the Church. I did not think of the statue itself but of what it represented. I did not worship it. I just thought about the Mother of Jesus. All I knew about her was that I'd seen nativity scenes when I was young and I had heard the odd joke about "a virgin having a kid." In my life, I had had many negative experiences with women: in and out of romances, and two abortions. Emotionally, I had hurt and been hurt. I had even cut off relations to my own mother. I had even spent two years in the gay community. I didn't think I could ever love a woman again. Then it occurredthat Mary was the mother of my Lord and Saviour (to whom I had surrendered a month earlier). I suddenly felt that I could love her. I didn't even know that the Churchyard where I was standing was Catholic. I didn't know the difference between Catholics and Protestants and I didn't know that a bunch of Christians thought and taught that this feeling about Mary was blasphemous. I only knew what my heart told me. I immediately looked for Churches to join. I looked at many denominations. I went to dozens of Churches. I felt mystified that many of these churches made no mention of Mary. I wanted to tell them about my secret but I was very shy in those days and did not speak or ask questions, in fact I had lost my voice as a singer and wrote on a note pad. I did not know the interdenominational dynamics about Mary. So I went back to the Church that had the statue. That is the Church where I belonged for 18 years until it closed in 2006. If it had been a different denomination I probably still would have joined it. I just loved the fact that they honoured this most beautiful woman who, helped heal my relationship to women and to my maternal mother. If you or I can perform miracles in the name of Jesus, why can't she? (Mat 10:1). Once inside the Church, there was another miracle. It happened before I knew the Bible or knew anything about angels or religion. There was a picture of Mary holding Jesus with an angel on each side. 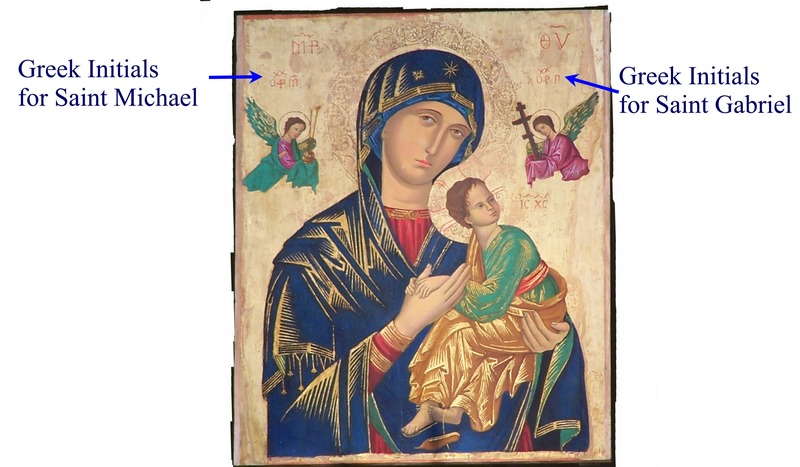 It was called "Our Lady of Perpetual Help" and was painted in the first centuries of Christianity. While sitting quietly, I asked Mary who the two angels in the picture were. I heard a woman's voice in my head lovingly and clearly say, "St. Michael and St. Gabriel." Six months later, I came into church and saw a document explaining the painting. If you look closely, there is Greek lettering above each angel, which translated means, "Michael" and "Gabriel." I don't read Greek! this was a confirming miracle that I was in the right place. Some might say, "this was the devil fooling you." However, let's look at the results of the experience. "You shall know a tree by its fruit." (Mat 12:33) The fruit of this tree is that it drove me deeper into a personal relationship with Jesus Christ, son of the living God - Mary's child. "No one can say 'Jesus is Lord' except by the Holy Spirit" (1 Cor 12:3). My relationship with Mary has been a major support in my recovery. I've been told by some of my Evangelical friends that icons are idols. Thank God I had never heard that before I had this miracle. It appears that God wasn't in the least concerned that I was looking at an icon. In fact he decided to make a miracle happen while I was looking at an icon. Thank God for the old Catholic stuff. Thank God for giving us Mary as a mother. Thank God for the miracles He is working through her. We must remember that the apostles Paul, Peter performed miracles in the name of Jesus. Even modern pastors perform miracles in Jesus' name. Catholics believe Mary can do the same. There was another miracle that Jesus performed through Mary. I had had a terrible eating disorder - anorexia-bulimia for several years. One day I said to Mary, "Mary you fed your Baby Jesus for all those years, I bet you could feed me." That was a decisive moment in my recovery program. I believe she performed that miracle in the same way as the early Christians cured people with the name of Jesus.